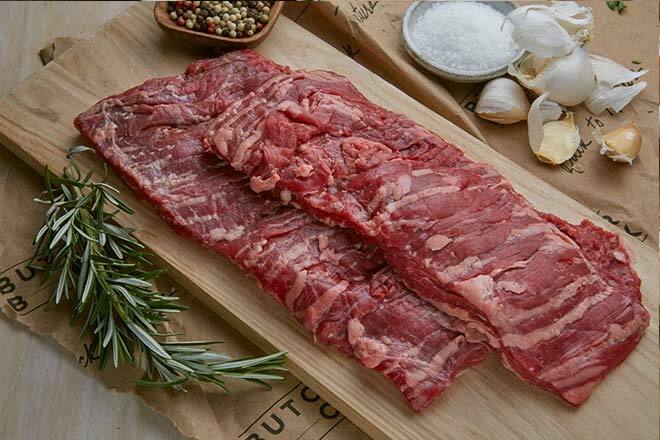 Similar to the Flank Steak, Skirt Steak is long, flat, and flavorful. It has an even deeper, beefier flavor than the flank, as it contains more connective tissue and a medium to high fat content. The default choice for fajitas, this cut has been a well-kept secret in Tex-Mex cuisine, and goes great with lime juice and cumin. Remember to season according to taste. Check out our great recipes for seasoning inspiration below! 2. For medium-rare, place Skirt Steak at 45° angle across hottest part of grill grates, then grill for 3 min per side, while rotating 90° every 1 ½ min. Move steak to cooler part of the grill, then grill for 3 min per side. Keep your meat moving to ensure that it cooks evenly. Remove from grill when meat thermometer inserted into thickest part of steak reads 120°F. 3. Rest for at least 8 min. Slice thinly against the grain. Our grass-beef is best enjoyed MEDIUM-RARE (125°F). Beef continues to cook 5 - 10°F after being removed from heat, so when cooking on high heat, remove it from the heat source 5°F “early” (120°F).